What does Heftruck / Reachtruck mean? Heftruck / Reachtruck are the Dutch permits for two types of forklifts. The Dutch companies require certificates issued by a Dutch examining institute. The training course and exam take place on a single day and are only available in the Netherlands. The certificate is issued in the form of a diploma and plastic card by a Dutch examining institute. The permits are valid for approx. 5 years. The certificate embraces two types of forklifts: Heftruck - front forklift, Reachtruck - side (warehouse) forklift. The Heftruck / Reachtruck training course embraces material developed based on commissions and guidelines included in Dutch regulations, including, among others, the Act on work conditions and the European directive (code 95). 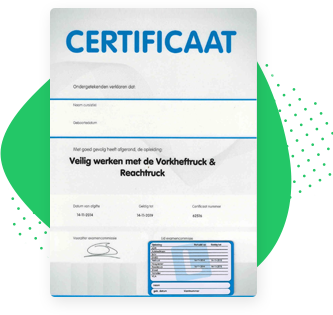 The Heftruck / Reachtruck certificate is intended for forklift operators. One-day training concluded with a theoretical and practical exam. The training courses and exams are available in Polish, English or Dutch. It is a one-day training consisting of the theoretical and practical parts. Stationary training conducted in Polish or Dutch. Duration: 1 day, 8 hours (with breaks for coffee and meals). 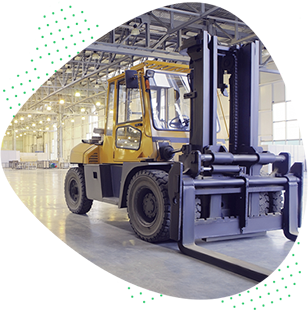 The purpose of the training course is to get the employees/subcontractors acquainted with the regulations concerning working as a forklift operator according to the Dutch regulations and preparation for passing the theoretical and practical exam in order to issue the "Working with a forklift truck" diploma. The training participants will acquire relevant knowledge concerning the hazards and methods of counteracting them, thus improving the awareness in terms of occupational safety. The Heftruck / Reachtruck exam consists of the theoretical and practical parts and takes place immediately after the training. The theoretical part lasts max. 60 minutes. The practical part features driving a forklift truck. The exam can only take place in the Netherlands.